Classpath in Java is the path to directory or list of the directory which is used by ClassLoaders to find and load class in Java program. Classpath can be specified using CLASSPATH environment variable which is case insensitive, -cp or -classpath command line option or Class-Path attribute in manifest.mf file inside JAR file in Java. In this Java tutorial, we will learn What is Classpath in Java, how Java resolve classpath and how Classpath works in Java alongside How to set the classpath for Java in windows and UNIX environment. I have experience in finance and insurance domain and Java is heavily used in this domain for writing sophisticated Equity, Fixed income trading applications. Most of these investment banks have written test as part of their core Java interview questions and I always find at least one question related to CLASSPATH in Java on those interviews. Java CLASSPATH is one of the most important concepts in Java, but, I must say mostly overlooked. This should be the first thing you should learn while writing Java programs because without the correct understanding of Classpath in Java you can't understand how Java locates your class files. Also don't confuse Classpath with PATH in Java, which is another environment variable used to find java binaries located in JDK installation directory, also known as JAVA_HOME. 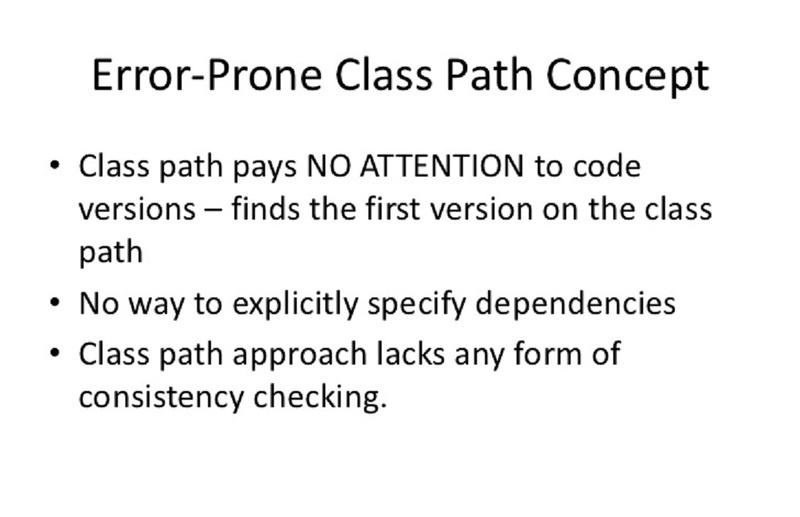 Unfortunately, books like Head First Java doesn't teach you much about subtleties of PATH and CLASSPATH. If you really want to test your Java skill, the one book I would suggest reading is Java Puzzlers, whose puzzles and explanation will help more to understand this kind of not so easy concepts. The main difference between PATH and CLASSPATH is that former is used to locate Java commands while later is used to locate Java class files. So let’s start with basic and then we will see some example and improvisation of Classpath in Java. In fact, CLASSPATH is an environment variable which is used by Java Virtual Machine to locate user defined classes. As I said In this tutorial we will see How to setup classpath for java in windows and Linux, java -classpath example in different scenario and use of java -classpath or java -cp. If you have just started learning Java, then I also suggest you follow a good book to learn Java e.g.Core Java Volume 1 9th Edition by Cay S. Horstmann. That will help you to grasp most of the fundamental concept in Java in a systematic manner. In order to set Classpath for Java in Windows (any version either Windows XP, Windows 2000 or Windows 7) you need to specify the value of environment variable CLASSPATH, the name of this variable is not case sensitive and it doesn’t matter if the name of your environment variable is Classpath, CLASSPATH or classpath in Java. Go to Environment variable window in Windows by pressing "Windows + Pause “--> Advanced --> Environment variable " or you can go from right click on my computer than choosing properties and then Advanced and then Environment variable this will open Environment variable window in windows. Now specify your environment variable CLASSPATH and put the value of your JAVA_HOME\lib and also include current directory by including (dot or period sign). Now to check the value of Java classpath in windows type "echo %CLASSPATH" in your DOS command prompt and it will show you the value of directory which is included in CLASSPATH. This way you can set the classpath in Windows XP, windows 2000 or Windows 7 and 8, as they all come with command prompt. By default, Java CLASSPATH points to current directory denoted by "." and it will look for any class only in the current directory. I have set my classpath environment variable as CLASSPATH=/home/tester/first:/home/tester/second. Now I have Test class of different version in both first and second directory. When I give a command "java Test" What will happen? Which Test class would be picked? Since JVM search directory in the order they have listed in CLASSPATH variable it will first go to the "first" directory and if it finds Test.class over there it will not go to /home/tester/second directory. Now if you delete Test.class from /home/tester/first directory it will go to /home/tester/second directory and will pick Test.class from there. It's also worth noting that when you use the java -jar command line option to run your Java program as an executable JAR, then the CLASSPATH environment variable will be ignored, and also the -cp and -classpath switches will be ignored. In this case, you can set your Java classpath in the META-INF/MANIFEST.MF file by using the Class-Path attribute. In short Class-path attribute in manifest file overrides classpath specified by -cp, -classpath or CLASSPATH environment variable. Now a common question if I have my CLASSPATH variable pointing to current directory "." and I have a class called "Test" inside package "testing" and with below directory structure C:\project\testing\Test.class in my computer. What will happen if I run the command "java Test" from directory "C:\project\testing\"? will it run? Since the name of the class is not Test, instead it’s testing.Test even though your classpath is set to current directory. Now what will happen if I give command java testing.Test from C:\project\testing\ it will again not run and give an error? Why because now it looking for class called Test which is in package testing, starting from current directory "." but don't find it since there is no directory called "testing after this path "C:\project\testing\". C:\project>java testing.Test and It will run successfully because of Classpath issues I prefer to use Eclipse rather than running Java program from command prompt. If you are working in Java, you must have faced some errors and exception related to the classpath in java, two most common issues related to java classpath is ClassNotFoundException and NoClassDefFoundError. I have seen that many Java developer tries to solve this error by trial and error; they just don’t look beyond the hood and try to understand what the reason for this java classpath related errors is. They often misunderstood that these two errors are same also. ClassNotFoundException is an Exception and will be thrown when Java program dynamically tries to load a Java class at Runtime and don’t find the corresponding class file on the classpath. Two keywords here “dynamically” and “runtime”. A classic example of these errors is whey you try to load JDBC driver by using Class.forname(“driver name”) and greeted with java.lang.ClassNotFoundException: com.mysql.jdbc.Driver. So this error essentially comes when Java try to load a class using forName() or by loadClass() method of ClassLoader. The key thing to note is that presence of that class on Java classpath is not checked on compile time. So even if those classes are not present on Java classpath your program will compile successfully and only fail when you try to run. “When do you see NoClassDefFoundError and ClassNotFoundException Exception in Java”. By the way, NoClassDefFoundError can also come due to various other reason like static initializer failure or class not visible to Classloaders in the J2EE environment. Read 3 ways to resolve NoClassDefFoundError in Java for complete details. 1. Classpath in Java is an environment variable used by Java Virtual machine to locate or find class files in Java during class loading. 2. You can override the value of Classpath in Java defined by environment variable CLASSPATH by providing JVM command line option –cp or –classpath while running your application. 3. If two classes with the same name exist in Java Classpath then the class which comes earlier in Classpath will be picked by Java Virtual Machine. 4. By default CLASSPATH in Java points to current directory denoted by "." and it will look for any class only in the current directory. 5. When you use the -jar command line option to run your program as an executable JAR, then the Java CLASSPATH environment variable will be ignored, and also the -cp and -classpath switches will be ignored and, In this case, you can set your java classpath in the META-INF/MANIFEST.MF file by using the Class-Path attribute. 6. In Unix of Linux, Java Classpath contains names of the directory with colon “:” separated, On Windows Java Classpath will be semicolon “;” separated while if you defined java classpath in Manifest file those will be space separated. Class-Path attribute is used to contain classpath inside manifest file. Also, make sure that your manifest file must end with a blank line (carriage return or new line), here is an example of java classpath in the manifest file. 8. It’s also important to note that path specified in the manifest file is not absolute instead they are relative from application jar’s path. For example, in above if your application jar file is in C:\test directory you must need a lib directory inside test and tibco.jar and log4j.jar inside that. 9. ClassNotFoundException is an Exception and will be thrown when Java program dynamically tries to load a particular Class at Runtime and don’t find that on Java classpath due to result of Class.forName() or loadClass() method invocation. 10. NoClassDefFoundError comes when a particular class was present in Java Classpath during compile time but not available during runtime on Classpath in Java. I hope you find this Java Classpath tutorial useful, please let me know if you have any doubt or any question related to "How to set the classpath for java" and I would be happy to answer :) keep learning. Your suggestions and comments are always welcome. If you like to read UNIX command tips you may find 10 tips for using find command in Linux, 10 tips to increase speed on Unix command and 10 basic networking Commands in Unix useful. That's all on What is Classpath in Java, How Classpath works in Java, How to set Classpath in Java on Windows and Linux and how to deal with Classpath issues in Java. How does Synchronization work in Java? Very nice article. I did not know about the -jar classpath implications. How do you specifiy classpath in META-INF (relative and absolute) ? You forgot to mention "endorsed" folder. With this header, the classes in the files tibco.jar, tibrvjms.jar, and tibco/tibcohawk.jar will serve as extensions for purposes of the applet or application. The URLs specified in Class-Path entry are given relative to the URL of the JAR file of the applet or application. I do not about "endorsed" folder though , would be great if you could provide some more details to us. JAVA_HOME/lib/endorsed - jars from this directory are also loaded. Intended use is to replace classes shipped with java, especially for technologies are in development between major java releases. Location of this directory can be changed by setting system properties. There are also these parameters, but I am not sure what the "intended" use is for them. "By default CLASSPATH points to current directory denoted by "." and it will look for any class only in current directory." The way it works, if you do not specify neither -cp nor -classpath and CLASSPATH is not set, then the classpath defaults to "." Thank you very much Adam for letting us know about "endorsed" directory and adding value to this blog. I am too not sure about -Xbootclasspath:bootclasspath but will post when I come to know about it. I have a doubt in this tutorial sir. You said that classpath is an env var which locates .class files stored in our computer. But while writing programs, we generally give something like "C:\jdk1.4.1\bin;"
But the .class files of our programs may be in any directory. So how does the system locate the .class file. I know this might not have enough information but i really need someone to help me walk through this. HELP! great article about java classpath mate, I have read couple of articles on java claspath but this one is simply great especially your tip on using classpath for debugging in java. by any chance do you know how to set classpath for eclipse and netbeans IDE ? Thank Anonymous you like my java classpath tutorial.I really like you find my experience useful.as far as setting java classpath on eclipse and netbeans they have there own build configuration in Eclipse just right click the project and select properties--> build path it will show you libraries which are in java classpath. Hi, Can we set java classpath at run time ? for example setting java classpath to find out new .class files or modified class files ? wild-cards in classpath for example C:\java-classpath-test> javac -cp C:\Java\JDK1.6\lib\* and it will include all jar files form lib folder. what is difference between PATH and Classpath in Java ? I always get confused between these two Can you please help ? Also how to set both PATH and CLASSPATH ? If you are using Java 1.6 and using wildcard to specify classpath make sure you don't have anything else than .jar file in your directory specified by wildcard , otherwise you could run into problem of "invalid classpath". e.g. C:\Java\JDK1.6\lib\* will include everything inside lib , so if you have something which is not jar e.g. a directory test , you will run into problem. into /etc/environment file. Perhaps a stupid thing to do. Now, though I can still compile (javac) from the terminal, I can't run (java) anymore. All return NoClassDefFoundError. Even after removing the line I added. Please help. perhaps you would like to change the title of post as "How to set Classpath for Java" which is more suitable.Claspath in Java is tricky until you have complete knowledge and it can be pick and overridden from various places e.g. 1) default classpath current directory "." 4) Classpath specified in Manifest file if you are running using java -jar option. Hi, is there any difference on setting classpath in windows XP and windows 7, I am going to buy new windows 7 license and wondering about setting PATH and Classpath on that,Please help. Can you also write about how to set CLASSPATH and PATH in Eclipse IDE and Ubuntu Linux. i had no problem, until i have installed "window builder pro" and have deleted again. Then i could not run my project. But thank you very much. "Classic example of this error is using log4j.jar for logging purpose and forgot to include log4j.jar on classpath in java during run-time." it was the answer of my problem..:) i dont know, how it was deleted from my classpath. But it's going now. Why do you need to set ClassPath in Java explicitly, Can't it get it from jar file and execute from there ? @Anonymous, yes you can setup Classpath inside Jar file in Java. Manifest file is used for same purpose. Very nice article. I have been reading your posts for some time. I really enjoyed all this brain food. Thanks a lot for sharing...Keep writing..
why don't you set a smaller font? this is too big! i am not able to execute jar command. i dont know what to install for executing jar command,it showing command not found, also their is no file called jar in "C:\Program Files\Java\jdk1.6.0\bin". I agree Understanding of ClassPath is important in order to avoid and debug notorious ClassNotFoundException and NoClassDefFoundError and you have done a good job on explaining both how java picks classes based on classpath and how to set classpath for java. Hi, This my attempt to get some advice on an issue we're experiencing. Evrytime an auto update takes place our server gets wacked. here's the classpath setup. There is a batch file named setclasspath.bat in D:\SafeWatch\Tomcat\bin on the Safewatch server. This batch file references an environment variable named JAVA_HOME. This environment variable has a value of C:\Program Files\Java\j2re1.4.2_08. I wonder if there could be a “Variable’ inserted in the Java-Home path setup that provides the latest “Java update Version” value after the update takes place. I'm don't know Java but been asked to resolve this challange. @Anonymous. you could possibly write a script which can check each java folder and can setup JAVA_HOME accordingly. look on PERL or shell script or even a simple DOS script if you are running on windows. sometimes it happens when we compile java program on cmd prompt ,it displays message 'javac' is not recognized as an internal or external command,operable batch or program file even after setting the classpath,why so? I still don't get it. Anytime I create a Java app I need to add that path to my system's environment variable or have a special startup config to do this? What's the point of putting things into packages and specifying where those packages are if that information's just ignored? What causes the information to be spontaneously lost in the middle of development where class that worked perfectly fine is suddenly the cause of CLASSPATH errors? hi!! I have downloaded a separate driver file(.jar)for oracle and it needs to be included in the classpath.Can you please tell me how should I do it? I am using jdk6 oracle 10g.where should I place that jar file? IN WHICH FOLDER? Hi Apurva, it can be any folder, you just need to add that folder on your Classpath ( an env variable, if you type echo %classpath% in windows cmd prompt you can see its value. if you want to avoid that hassle then put oracle driver.jar in JAVA_HOME/lib folder which mostly remain in classpath. Hi Thakur, Steps for setting ClassPath in Windows XP is exactly similar to steps given here. Please let me know if you face any specific issue while setting Classpath in windows 7 by following above steps. Thanks for the tutorial which helped me understand the concept of classpaths. But I still can't figure out why it isn't working with me. I'm using eclipse on Linux. But when I tried running the program using the console, I always get Exception in thread "main" java.lang.NoClassDefFoundError: Main (wrong name: fib/Main). I even tried giving the classpath "." using the option -cp, but I still have the error. I'm still a beginner and I don't know what to do, I was wondering if you could help me please. 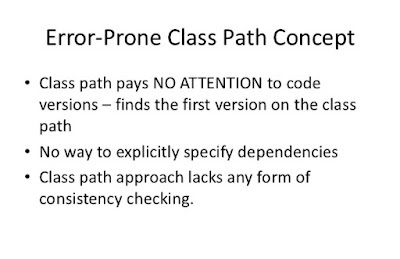 Why class path is required for compiling java classes.... So tell me Why is required?? Love the effort that you put to write these tech articles. Big fan. Keep it up buddy. We need more people like you on this forum. the jar file is working properly in Windows but same jar file is not working in linux. I have to explicitly set the classpath or directly insert the ojdbc14.jar file without lib folder. I have installed JDK1.7 in my system. I have complied sample program FirstJava.java as shown below. I complied successfully. FirstJava.class is also formed. But when I try run the .class file I am getting error as shown below..
Error: could not open `C:\Program Files\Java\jre6\lib\amd64\jvm.cfg'. Kindly help me out with this error.. Thanks a ton buddy :-). I always used to get confused between PATH and CLASSPATH even though i went through many articles. you have successfully set path and classpath. You have your workspace in a different directory. Now, how does JVM know about these classfiles when they are in a different directory??? Check whether you have installed jre along with jdk.. Also check in the control panel whether the JVM is there or not.. I have a question, What happens if you have two classes with same name and from same package but on different JAR, which one will be loaded by JVM or ClassLoader? We have created a class to hide same class from one of the open source library and we are facing issues, when sometime class from open source library got picked up, against the one which we have written. We have not customized classloader and only bootstrap, extension and application classloader are in use, i.e. it's typical core java application. Please advice. Hi thanks for such a nice blog. After going through your blog, i understood what a classpath is. I feel motivated after reading your blog. Will get back to your blog for more learning. Thanks for post, at Setting Java Classpath in Windows part in step 3 it should be echo %CLASSPATH% not echo %CLASSPATH. Keep blogging, thanks again. Could you please provide zoom option for the Environment Variables window at the top. It is hard to see the value you have given, to take as an example. Several people have asked "Where do I specify the class path?" Some haven't received a satisfactory answer. Let me offer an approximately correct and hopefully useful answer. Critical feedback is welcome. Java can look for a class in another project or in a library (jar). You give it an ordered list of places to look for classes. That's called a "class path". Use Project > Properties > Java Build Path to tell the Java compiler (JDK) where it can find classes that your code references at compile time. Making the list complete and in the right order may clear up a build error. Use launch configurations (menu Run > Run [or Debug] Configurations > Classpath tab) to tell the Java runtime (JRE) where it can find classes that your code wants to load dynamically at run time. Making the list complete and in the right order may clear up a ClassNotFoundException. @nomodes, I believe you are talking about how to specify classpath in Eclipse? isn't it? ClassNotFoundException: you say that at compile time, claaspath is not checked for a particular class so exception occurs while dynamically loading a class which is nogt present in the classpath. Later in NoClassDefFoundError, you say that it happens because a class was present in classpath during compilation but later could not found at runtime. This differs from the first explanation which says classpath is not checked at compile time. very helpful article, it help me solve some daily problems! I simply want to be able to set up my Windows 7 system so that I do not have to enter "PATH" and "CLASSPATH" each time I desire to run a Java program. Can someone please just set out the steps -- simply and clearly -- without a load of explanation that I will not understand anyway? Hello @Billy, here are the steps to setup PATH in Windows 7 system, no explanation just steps.